We're celebrating Independence Day with a week-long automotive Amerigasm heading down two diametrically opposite roads. The first, started yesterday, is a salute to the best car commercials — a celebration of the conspicuous over-consumption that made this nation great. The second road is one we'll be traveling at government-mandated speeds — a salute to the police car. While The Man may always be trying to keep us down, we salute him for having some killer vehicles with which to do it. You can take both roads this week here. —Ed. We've compiled a list of the greatest American police cars in honor of our patriotic, week-long Independence Day celebration. Whether on the big screen or the rear-view mirror, the radio car is as much a part of the ubiquitous American landscape as the golden arches of McDonalds or the billboards offering "Color TV" to road-weary travelers. Though they represent different things to different people, and we don't always love the people inside, they're there and, in the true American spirit, the cars are usually big, fast and strong. Which is why we love them. Check them all out and vote for your favorite below the jump. Though America may be the the country that nurtures the individual, we sure like to get arrested in groups. That's where the paddy wagon comes in handy. Part truck, part temporary jail, there have been a lot of them throughout the history of American law enforcement. This 1947 International wagon is a particularly beautiful example and a reminder of International's long commercial history in America. That cop is totally riding the wagon. Specifically, a Desert Patrol Vehicle (DPV), these are some of the most extreme police vehicles used for active patrolling duty. Typically, a DPV is fitted with a VW engine capable of nearly 200 HP. These vehicles can travel up to 80 mph and generally encounter some of the roughest terrain in the country while enduring severe temperature conditions. These go fast in places that Border Patrol SUV's can't even reach. The forerunner to the Crown Victoria, the Fairlane may look even better than the Chevy Bel, and its low cost meant that it would provide police services for a large part of the country. The Fairlane is particularly noted for its powerful big-block V8, popular with the authorities around the country. In black-and-white it is one of the more iconic police cars ever built. This Wilmington, DE "Bureau of Police" squad car is an exceptional example. There were many great Mopar police cars throughout the years, but we've got a soft spot for the 1970 Dodge Coronets. Not only do they have the 440 Magnum V8, good for in excess of 400 horsepower, they also feature that killer squinting headlight design that looks mean head-on. Oh, and the one above was featured in the original Gone in 60 Seconds giving it almost as much movie cred as the Dodge Monaco. The original Mustang LX highway patrol car, a favorite of the Texas DPS, haunted our dreams with its sharp facade, red interior and 5.0-liter V8 power. Though the hatchback Mustang would, theoretically, have been useful, the DPS stuck with the notchback 'Stangs. Mustangs were used in the DPS fleet between 1983 and 1993, with the 1986 model, pictured, our personal favorite. As you can probably tell from Mark's glowing review of the Dodge Charger Police Edition, we're big fans. Just look at it. Probably more the successor to the Coronet than anything, especially with the recurrence of the angry headlights, the Hemi-powered Charger is gorgeous, features a stalk-based Autostick, and has great road manners. Numerous police officers lusted after the ride, which is the best kind of accolade. 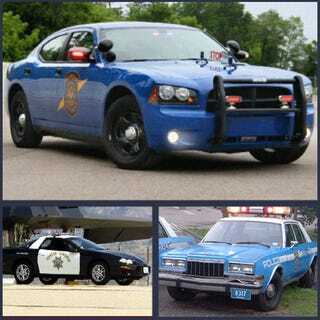 In Michigan State Police blue with a cherry on top, it's even better looking. The M-bodied Dodge Diplomat and its twin, the Plymouth Gran Fury, aren't here purely out of nostalgia. Look at them. It's hard to believe they were anything but cop cars. What they lacked in power relative to some of the Dodge fleet vehicles of the 1960's and early 1970's, they more than made up for in durability. You couldn't kill them if you tried. Most models featured the 318 V8, though a few pursuit models included a 360 four-barrel. Imagine any upset renegade cop from an 80's police movie kicking the quarter panel of one of these bad boys. P71 Crown Victorias never die, they just become taxis. Due to the disappearance of American-made RWD V8 sedans for nearly a decade, the Ford Crown Victoria became more ubiquitous than any other police car we can think of in any era since the Model T, despite the occasional deadly fire. Powered by a modified version of the Ford 4.6-Liter SOHC V8, they'll practically run forever, thanks in part to the oil-to-coolant heat exchanger. Even with the introduction of the Charger Police Package and the occasional Impala police car, Ford still plans to carry about 80% of the police market. Is there anything that reminds anyone more of the long arm of the law than a P71 Interceptor sitting on the side of the road? We didn't think so. Of course, if you don't like any of those choices, you can always write-in your favorite in the comments.